When you’re on the hunt for a new truck, that hunt should definitely include Toyota’s smaller pickup truck, the Tacoma. With rugged styling and many different customization options, this truck offers drivers in the Indianapolis area the power of choice when buying their next truck for work or play. 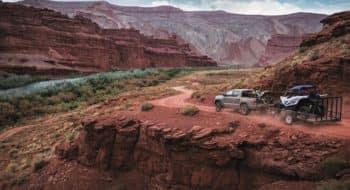 The engine lineup of the Toyota Tacoma through the recent years, coupled with the towing capacity, gives drivers the ability to use their truck for bumping through rugged job sites or for the smoothness of the highway. At Andy Mohr Toyota, we give our customers a wide array of vehicles from which they can select their next truck. If you’ve got the day to spend in Indianapolis, but not a ton of money to burn through, have no fear. Indy offers a bunch of activities that both kids and adults can enjoy for free. With a variety of different places to go and activities to get into, you certainly won’t be calling this city Naptown, like its nickname. The last thing you’ll want to do is sleep on this town! Here are some of the most entertaining free things to enjoy in the Railroad City. Galleries – On the first Friday of every month, you’ll have free reign to take self-guided tours of 25 different art galleries in Indianapolis. See what the local artists have to say with their brush strokes or photographs. City Market – Open Monday through Friday, you can stroll through Indianapolis City Market and see what all the locals have to offer. This market is the home of over 25 different local business who have set up shop to sell their wares. Grab a cheap bite to eat or just use your time to walk around. Cultural Trail – If you’re looking for a nice and easy 8-mile walk or bike ride, give the Indianapolis Cultural Trail a try. Hit up six different cultural districts, such as the White River State Park. With dozens of different configurations of Tacoma trucks on our lot, you’re not going to have any trouble finding the exact truck to fit your needs. 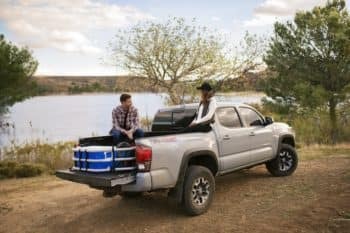 Whether you’re shopping for a work horse of a truck or if you want the space for the whole family, there’s a Tacoma that offers the perfect options. In addition to all of the different brand-new models we have to offer for sale or lease, we also have several different used trucks as well. If you need your truck to have some mileage on it or if you’re looking for something a little bit more economical, we’re confident that you’ll find something that works. With six different trim levels available, you’ll have a great time shopping for your ideal truck. From the entry-level model to the rugged and ready TRD Pro, your next truck configuration will be here on our lot. With the addition of Toyota Safety Sense™ as a standard feature, your truck will also provide the peace of mind that comes from impressive safety. 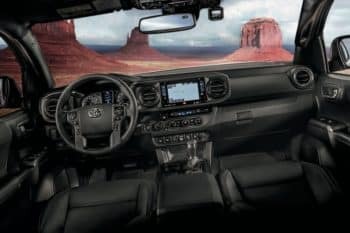 In the SR5 model of the Tacoma, you’ll be able to select your ideal cab, bed, and drivetrain, while with the TRD Pro, you’ll have the option of a manual transmission to fully control your drive experience. With the Limited model, you’ll have one of the fanciest trucks on the block and you’ll have the addition of Parking Assist Sonar and anti-theft engine immobilizer. If you’re shopping for a brand-new Tacoma, you may want to consider our lease options. Leasing allows you to get a new car with less commitment than traditional financing. You’re not locked into a loan for years, you get a car at the end of the lease term when you renew and typically your payments are lower than with your average car loan. If you’re looking to purchase your new or used Tacoma, we also support traditional financing options. Whether you have excellent credit or if you’ve got some spotty history, we work with several different lending institutions. With our vast network of lenders, we can find great loan options for nearly all our customers, regardless of credit history. When you’re ready to lease or buy, all you have to do is come see us at Andy Mohr Toyota. We have a friendly, accommodating, and knowledgeable team that will do everything they can to help you find the Toyota Tacoma that fits your needs. Drivers in the Avon, Indianapolis, or Plainfield areas will have no problem making their new or used truck work for them.